We make decisions by first of all coalescing a large number of possible outcomes into a single polar and binary choice. After all, this is the same way politics among people allocates otherwise public resources by making more or less transparent decisions . When governments first form, there are many initial choices that can be quite contentious, but eventually a government of one sort or another does form. Likewise, people first learn how to choose from many possible outcomes by this same process of coalescence. When a government forms, mature and developed governments necessarily then limit individual freedom and choices become more and more trade offs and compromises with near equal benefits to different factions. With near-equal trade offs, though, there are invariably very vocal factions on both sides of each choice. People argue that it is necessary for there to be transparency in the decision-making process to inform people who must accept the inevitable compromises. Political decisions invariably mean that there are two or more different precursor actions for the same outcome and so the factions must compromise. However, transparency in a highly informed culture necessarily results in incremental coalescence from the chaos of many possible choices into increasingly polar factions for any choices condensing into a binary decision point. People naturally make decisions by incremental coalescence from the chaos of many possible outcomes into the order of a binary choice of action or inhibition. The initial chaos of many possible choices about an issue eventually condenses into a binary decision to incite or inhibit action. The electronics of our information age allow people to participate in many more incremental compromises than in the past that are all part of each decision. As a result of these incremental choices, people tend to end up in one of two polar extremes associated with each decision. Issue polarization is then a necessary part of any decision making process, but the information age has exponentially increased the number of people in political decisions. Some people value the chaos of individual freedom more than the order of group authority and others value the order of group authority more than the chaos of individual freedom. Limited group authority allows large numbers of otherwise anonymous people to live in the order of a cooperative and yet still competitive civilization. However, excessive group authority has very well known undesirable outcomes as tyranny and political suppression. In particular, previous regimes were tyrannical and have justified policies that harm or even kill some people as long as many more people benefit overall. Mao’s famine killed over 30 million people in 1958-1961 ostensibly in order to benefit the much larger population as part of Mao’s great leap forward in the name of Marxism. The Nazi death camps killed 6 million Jews and others in order to purify a much larger race of Aryan race in the name of eugenics. Two people on individual Cartesian paths exchange shine of compassion with each other and that exchange can bind those two into a relationship. Cartesian bonds, like gravity bonds, result in more determinate action with outcomes that have clear precursors. Each person has as part of human nature both the capacity for good as bonding to a group as well as the potential for malevolence, which is conflicting. In other words, people have a certain amount of compassive shine for others and their needs as well as certain amount of selfish needs of their own to satisfy, which leads to conflict. A person’s selfishness might not benefit and might even harm someone else’s needs or wealth and even might take their lives. However, there are many ways for people to compete for resources with others and yet still cooperate and compromise with the overall outcome of more wealth for all. Even though two people might not ever have equal wealth or even equal benefit from every competitive or cooperative transaction, they can still both benefit and live longer and learn more to compete for wealth as well as to cooperate and compromise. A group of people bonds with the relational shine of compassion despite the Cartesian conflicts of selfish competition. Relational bonds, like quantum bonds, result in more probabilistic action with outcomes that often have no clear precursors, only more likely ones. It is part of human nature to compete with others for resources, but that competition must first of all involve cooperation and compromise and must therefore be fair even though the outcomes do not always have to be equal. Some people are naturally more talented than others in any given competency and so people are naturally diverse in their abilities. For example, there are only a very few people who are really very good at creating music and art and this means that, given individual freedom, a limited number of people can end up owning a large share of a population’s music and art. As a result, people can often feel envious and jealous even if the competition was fair. Further, if people acquire wealth by force or coercion and not by fair competition, those who suffer will inevitably feel deep resentment. Such deep resentment results in criminal and even rebellious outcomes and the response is incarceration of those people. In fact, given the malevolence of human nature, it is literally impossible for any population to completely avoid some criminal incarceration. Populations with large disparities of wealth along with diverse race, ethnicity, language, or religion also have large incarceration rates. All that people can ever hope to do is maintain a fair competition for resources given individual freedom and limited group authority to permit competitive and free prosperity while also limiting the unfair outcomes of criminality and rebellion. Religions satisfy a basic human need for meaning and purpose and people therefore submit to the order of those group authorities. Religions give meaning and purpose by retelling the many ancient stories of morality and malevolence and thereby derive a religious cosmic order from a seemingly meaningless quantum chaos. The bonding of people into a religion always involves their giving up some personal freedom for the benefit of learning the archetypes, stories, and rituals of that religion. In fact, all people must learn the archetypes of compassion and shame to live in a cooperative and yet still competitive civilization and religion provides those archetypes. Today there has been a remarkable reduction in global poverty along with increases in life expectancy and education. These successes seem to have been largely driven by the rise of individual freedom along with the proliferation of competitive and fair markets. Although competitive markets varies widely among different governments, the one consistent factor continues to be the incentives and pricing of competitive markets. Even countries with particularly high wealth disparities like Namibia show that competitive markets still reduce poverty while increasing both life expectancy and education. Ever since China and India have allowed more incentives for competitive free markets, those economies have grown and will continue to grow. The growth of competitive markets repeats in Africa where even the most impoverished countries continue to show people with longer lives, more education, and less poverty. If a person and the earth were both growing in size and gravity was shrinking at the same rate, the person could not tell since what they say and felt would not change. Growing matter and shrinking gravity would then explain gravity as long as gravity decreased at the same rate. 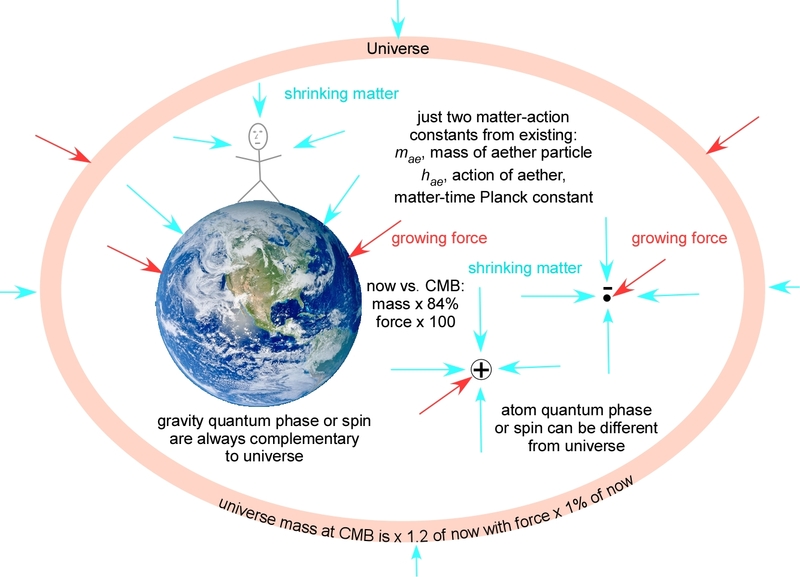 The force of shrinking gravity in direct proportion to matter growing would mean that universe is made up of both growing matter and shrinking force. There is a cosmology that unifies charge and gravity based on the exact opposite, which would be a universe of shrinking matter and commensurate growing force. In fact, a famous quantum physicist Paul Dirac first proposed the Dirac large numbers hypothesis in 1937, which set the ratio of the size of the universe to the size of the atom to the ratio of charge to gravity force. In the large number hypothesis, many constants change slowly in time and that distant galaxy light red shifts do not mean universe expansion but simply that precursor forces and matter were both different from ours. 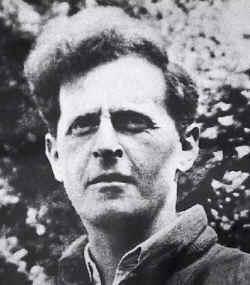 Since spectral line splittings of distant galaxy light do not change from ours, mainstream science long since rejected the large numbers hypothesis as did Dirac himself. 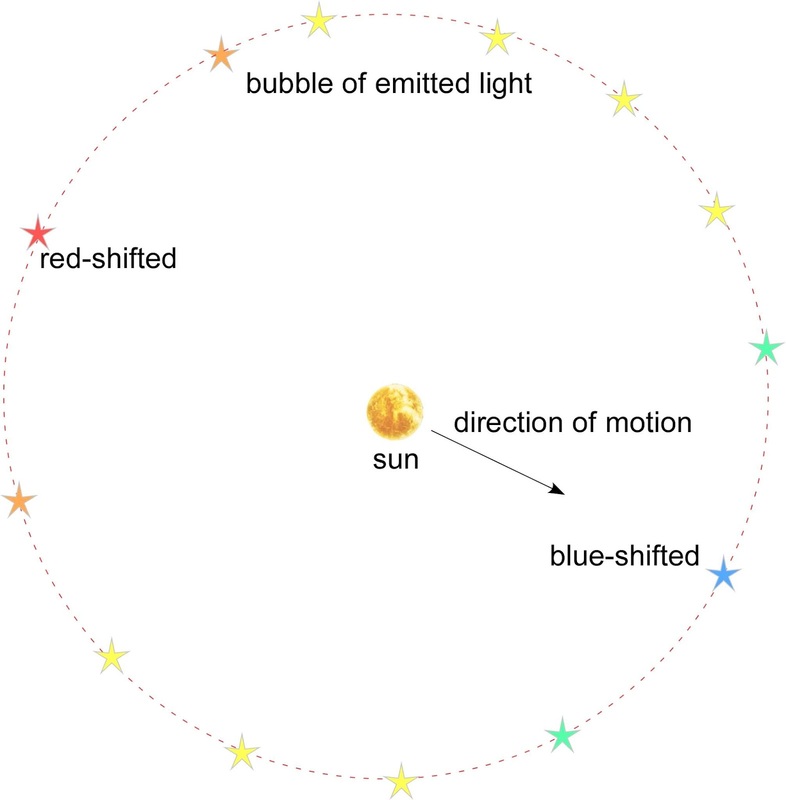 That is, while the red shift of distant galaxy light indicated universe expansion, the spectral splittings seemed to show that forces did not change with any precursor galaxies, only red shift. However...if outcome matter shrinks and forces grow, this would explain why precursor galaxies are red-shifted and explain why distant galaxy spectral line splittings do not change. In fact, it means that our reality is actually changing very, very slowly and it takes literally hundreds of years to measure the change...or much greater precision than current measurements provide. However, very soon high precision measurements will be able to measure these changes. Such measurements will show neither string theory nor quantum loop gravity nor supersymmetry nor multiverses are valid. In fact, string theory can never be disproven because it can explain anything...therefore string theory has no predictive value. The notions of outcome matter shrinking and force growing are consistent with quantum cause and effect of the precursors and outcomes of both gravity and charge and so does represent a unified theory of everything. However, the universe is then first of all a quantum causal set where there are many possible outcomes to any given precursor. A quantum causal set universe is not then determinate, unlike Einstein’s relativistic gravity in macroscopic time and space. While we normally think of time and space as a preexisting backdrop for matter and action, in a quantum causal set, matter action outcomes are the result of precursors without time and space. In fact, time and space both then emerge from the family relationships of precursors and outcomes along with the extra entanglement of quantum phase. Both matter and action have relative quantum phases that are also important for determining outcomes from precursors. Time then emerges from electron spin period and space emerges from electron charge radius and electrons, protons, and neutrons and the entire universe is made up of discrete quantum aether particles. There are then only two constants from which all other constants emerge; the mass of a discrete aether particle and the action of that same discrete quantum aether as the matter-time Planck constant. The Planck constant is the proportionality between light’s frequency and its energy and is the basis of our physical reality. Max Planck derived light’s quantum to explain why microscopic charged matter of electrons and protons did not behave like macroscopic charged matter. The matter-time Planck constant is likewise the proportionality between aether frequency and its mass as energy. In matter time, just as in Einstein’s relativity, energy is proportional to mass times the speed of light squared, E = mc². 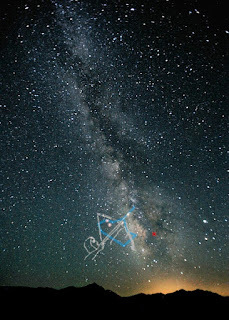 With matter action, time and space emerge from aether action: time from aether spin period and space from aether radius. This makes discrete aether action consistent with both gravity relativity as well as quantum charge, but now as a discrete aether quantum causal set. All other particles emerge as aether condensate outcomes and constants as aether precursors and in particular, the cosmic microwave background surrounds us with the light of creation precursors. Creation was the condensation of a certain very small fraction of precursor aether into the 2.7 K microwave, electron, proton, and neutron outcomes of all of our atoms today. Each atom today exists as a result of the emission and action of light at the CMB creation. Gravity emerges from the collapse of aether at the scale of the universe and charge emerges from the collapse of aether at the scale of the atom. An electron has a spin magnetism that couples with its orbit magnetism in each atom to give a spectral splitting. Even though electron mass shrinks, its spin increases just as the electron orbit spin also increases. There has not yet been a single math foundation of our reality, rather there have been two rather incompatible maths and yet both depend on the realities of continuous space and time. The math of relativistic gravity shows the direction and velocity of discrete macroscopic objects as they move through continuous space and time in one determinate direction. The math of quantum charge, in contrast, shows the direction and velocity of discrete microscopic objects jump in many directions and even forward and back in time, ostensively through that same continuous space and time. Whereas a gravity outcome is determinate and certain, a quantum outcome is probabilistic and uncertain. While gravity outcomes are determinate and not subject to free choice, quantum outcomes are subject to free choice. A gravity clock always ticks forward, but a quantum clock can tick in either or both forward and reverse. Each quantum moment is then a superposition of the past along with many possible future moments. The discrete moments in quantum time superposition eventually phase decay into the reality that agrees with gravity time, but before that, quantum time represents a fundamental confusion between gravity past and gravity future. For a determinate gravity path in space, there is a determinate path from precursor to outcome that has some chaotic noise along the way. Every infinitely divisible step on the path is determinate and so there is no free choice since there is no quantum phase decay despite an infinity of steps. Precursors completely determine each outcome and there is no entanglement of the quantum phases of any other outcomes. This means there is a shortest path called a geodesic whose outcome does not change unless there are outside forces that act. A Hamilton-Jacobi equation then predicts any action by using the difference in kinetic and potential energies, called the Lagrangian. A probabilistic quantum path does not follow a single determinate geodesic path, but rather each step of a quantum walk is a result not only of precursors, but also a superposition of the quantum phase of many possible discrete outcomes. The steps in a quantum path are limited by the fundamental granularity of the universe. Each step therefore involves a free choice that entangles those many outcomes and so the path is always probabilistic and never determinate. A quantum outcome is not only determined by its precursors, but also by the phase entanglement of other outcomes. There is actually no way to predict gravity and charge with a single equation in continuous time and space. While the Hamilton-Jacobi equation determines each gravity path according to the difference in kinetic and potential energy, the quantum Hamiltonian Schrödinger equation determines each quantum path according to a total energy (i.e. relativistic mass) and includes quantum phase. Unlike the energy difference that determines gravity paths, the total quantum energy includes quantum phase entanglement. This means that the quantum phase of the mass of an action is orthogonal to the quantum phase of the action itself. The entanglement of quantum phase between two two gravity bodies means that the precursors of continuous time and space determine gravity outcomes. The math foundation of our reality is actually based on the discrete matter action of outcomes from precursors. Instead of the two notions of gravity and charge based on continuous space and time, the notions of time and space actually emerge from our primitive reality of quantum matter and action. For discrete quantum charge, it is easy to show how discrete outcomes are the progeny of discrete matter and action precursors. The archetypes of continuous time and space then emerge from discrete matter action outcomes of quantum single photon charge. Time emerges from electron spin period while space emerges from electron charge radius and the Hamiltonian Schrödinger equation and the total energy is the math, but quantum phase links matter and action. For discrete quantum gravity, the archetypes of continuous time and space emerge from the quantum charge as electron spin period and radius. 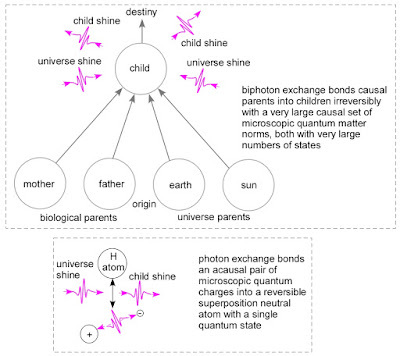 While single photon exchange bonds charges, photon pairs as biphoton exchanges determine the outcomes of quantum gravity. This means that instead of just the Hamiltonian and the total energy of single photon exchange, it is the action Hamiltonian-Jacobi equation of the kinetic and potential energies difference of biphoton exchange that is the math of quantum gravity. The kinetic and potential energy difference of that biphoton exchange then determines a unique direction in time and space for each outcome. For example, if KE=PE, the difference or action is zero and the direction is then unchanged for biphoton exchange just as for classical relativity, but a quantum action can spontaneously emit a photon and then change direction since it is a single photon exchange. Time and space are very strong and powerful unconscious archetypes that help us fill in the blanks for the reality that we perceive. And yet, we have no memory of how we learned these archetypes. We can get a sense of how we learned time and space when we watch a child develop their first order consciousness of space and time by the age of about two years. And yet what does an age of two years mean without time and space? It is not possible to remember anything without the archetypes of time and space since memory uses these archetypes to connect outcomes with their precursors. Long-term memories still need even more relational archetypes like compassion and selfishness before that child can retain long-term memories by about age six or so. The relational nature of memory is then an important part of the underlying nature of our physical reality without time and space. That is, instead of reality being grounded in an objective reality of continuous and infinitely divisible time and space and our relations with others, reality is really first based on the subjective reality or matter-action relations of discrete outcomes and their precursors. This discrete relational reality supposes that instead of time and space existing as a objective reality for matter action, it is from the subjective matter-actions of discrete neural outcomes of discrete precursors that continuous time and space emerge as essential archetypes that relate memories of action with sensation. Objective reality is really then a discrete causal set of a large number of outcomes along with their precursors. Instead of being continuous and infinitely divisible time and space, discrete outcomes that all relate to discrete precursors is first of all what makes up of our objective reality. This means that our objective reality actually is actually a very large number of discrete outcomes that just appear continuous just as discrete neural action potentials make up our subjective reality.This is the causal set of discrete quantum aether. Time and space are very important notions that we all use to associate matter action precursors with outcomes. We learn to use time and space for predicting outcomes as children, but time and space are not really fundamental even though they are very useful. The permit us to predict We predict outcomes in an external world with the unconscious archetypes of time and space and that objective world of precursors and outcomes then agrees with others. We do not actually directly sense either time or space even though these notions embed deeply into both our subconscious and conscious minds. What we actually sense are things that happen, called outcomes, and then we deduce with reason the precursors for those outcomes that we call causes. However, there is not only a large amount of information from sensation, that information is often incomplete or inconsistent. Therefore, confirmation bias is the natural result of the rational mind trying to make sense out of the often very large amount of sensory information that overwhelms our mind. Therefore we use our mind's unconscious archetypes to fill in the blanks of perception and provide missing or incomplete or conflicting information for the reasoning of our rational mind. These archetypes are the means by which we make sense out of the external objective world by focusing the conscious mind on important versus ancillary sensory information. From any given outcome, our mind tends to focus on the sensory data that confirms the biases of our subconscious archetypes and so we tend to ignore sensory data that does not confirm those biases. The natural bias of our subconscious decision process it very well known and is the basis of religion and philosophy. In fact, science itself has a long history of well-known bias dating back many centuries. Ptolemy supposed that the earth was the center of the universe and that was a very strong belief until Copernicus and then Galileo. Early physicians believed bad air and evil spirits caused illness before the science of germs and viruses and yet there remain affects of illness that do not result from germs or viruses and still remain somewhat mysterious. We sense a large number of outcomes from the world outside of our mind, but really we only focus on the very few precursors of outcomes that have some kind of immediate relevance. Our minds assign the vast majority of outcomes that we experience to precursors based on memory and unconscious archetypes and not on immediate experience. This is part of confirmation bias. At the core of all well-founded belief, lies belief that is unfounded. — Ludwig Wittgenstein, 1951. In fact, religion is more than a few statements of belief and the stories of the bible from which these statements arise are part of the grand narratives of civilization. Do not atheists also believe in the mystery of being just like religions? Without the unfounded beliefs of unconscious archetypes, there would be no consciousness and it is the unconscious archetypes of unfounded belief from which emotion, feeling, and free choice all emerge. Perhaps it’s true that we all have some unfounded core beliefs, and atheists and theists differ with respect to them. The fact that we all have unfounded core beliefs doesn’t necessarily put atheism and theism on an equal footing rationality-wise, however. Some theists insist atheism’s core assumptions are self refuting (‘Naturalism is self-defeating, while theism is not! (Plantinga)’). However, the inverse is probably true. For example, if the atheist’s core belief is their senses are trustworthy, while the theists core belief is that God exists, and this in turn allows them to trust their senses (cos God is no deceiver). Theists then run into the problem that human behavior reveals ample evidence that their God cannot be all good since there is much evil in the world, while the atheist does not have that problem. In addition, belief in God is also less economical than no belief in God and so, arguably, Occam’s Razor favours atheism. Given that both atheists and theists have unfounded but different core beliefs, the next question is about whose morality is superior, i.e., which morality improves survival and reduces suffering and evil. Do atheists have a better morality from their pure reason by using the tools of science as opposed to the religious morality from the grand narratives of civilization and religion? Since atheists derive their morality from the same grand narratives as religion, they cannot claim atheist morality is any better than religious, merely equivalent. Atheists often simply claim that they distill the best morality and wisdom with reason from the grand narratives and then reject all of the mysticism, social structures, literature, art, and music as your Occam's razor statement that favors atheism. The tools of science are not very useful for morality and, atheism and secularity, have has not yet shown any semblance institutions to replace or supplant the institutions of religion. In fact, secularism seems rather dull compared to literature, art, and music of religion and does not seem to prepare people for the inevitable suffering and misery that are often a part of life. The atheist's core belief cannot be only in that sensation is trustworthy because there are so many sensory illusions and many sensations that consciousness simply invents or ignores. The basic unconscious archetypes of atheists and religion are both in place by the age of about 5 or 6 as the foundation of consciousness and memory. It is only much later in life that people use reason to choose atheism or religion and then accept or deny what already exists as their morality. History repeatedly demonstrates that reason can subvert one morality when there is strong purpose with another morality. Hitler's Holocaust, Stalin's famine, Mao's famine, Pol Pot's Killing Fields, Ataturk's Armenian genocide, and so on were all evil outcomes done for moral purposes. It is here where atheism fails and religion succeeds. There are many great narratives with highly resonant messages that also have very deep flaws, like the class warfare of Marx's Das Kapital or the antisemitic racism of Hitler's Mein Kampf. However, the malevolence of these grand narratives is not always readily apparent except in the outcomes of misery and suffering. This video addresses two age old problems of free will: the problem of the determinist and the problem of a person knowing everything means knowing what will happen and that person can then change their mind anytime in spite of knowing what will happen. These two arguments are very similar to the equally old religious teachings of the Swiss determinist John Calvin and the Dutch free willer Jacobus Arminius. On the one hand, the video argues that determinist physical laws would mean that everything is predetermined and there is no free will, which is Calvinist. We simply believe in the illusion of free will. The video terms this metaphysical as the figure shows. On the other hand, the video further argues that with complete knowledge, outcomes would be published in a book of life and a person can then just look up to see what will happen to themselves. But then the video further argues that since someone can look up what will happen to themselves, like a light bulb turned on, they can still then choose to do something different from what was in the book and turn the light bulb off. The video terms this epistemological and argues that a determinate outcome is not possible since the book of life is always subject to choice, the Arminiaist. However, we actually live in an uncertain quantum causal set and not in a determinist universe of space and time. There is no book of life that tells us with certainty what will happen. Quantum uncertainty means that the observer of a light bulb necessarily does affect whether the observed person turns the light bulb on or off. Moreover, unlike the particular determinist precursor in the video of the outcome of the light bulb state, there is no way to know for certain the corresponding quantum precursor for the same outcome of the light bulb state. Science has known about the surreality of quantum uncertainty for many decades and yet both philosophers and scientists continue to argue about what this quantum uncertainty means for our seemingly classical and causal world. This is because our macroscopic reality of relativistic spacetime gravity does not seem to involve the microscopic uncertainty of quantum phase even though quantum uncertainty is most certainly there. Quantum phase is after all just the problem of there being an unknowable precursor for the outcome of who switches their light bulb on first...John Calvin or Jacobus Arminius. These arguments about determinism versus free will all come down to given a choice between good and evil, some people still choose evil inspite of any all-good ideal. In a determinate world, the choice of evil is not their fault but merely reflects the precursors of their particular life. Given free will, however, it is always possible to choose evil despite an otherwise all-good ideal and so there cannot be a perfectly all-good ideal after all. John Horgan recently wrote about the twilight of science's high priests, two of whom are Stephen Hawking and Martin Rees. Horgan is a longtime predictor of the end of science and often decries the lack of any progress in particle physics as a key example. Horgan likes to pick on particle physics since like many other writers, Horgan presumes that particle physics is representative of all science. However, particle physics has mainly to do with the nature of matter and action and since matter and actions are finite and limited, particle physics is therefore also finite and limited. For example, once science identified all of the elements, that science was done even though science continues to synthesize more and more exotic and unstable elements with shorter and shorter lifetimes. However, science has been making compounds with the stable elements and Mother Nature has been making all kinds of life with those elements. Science has a never-ending task in taking apart the never-ending molecules of the chemistry of life. Nuclear matter, just like the elements, is also finite and largely exists as just electrons, protons, and neutrons at the very low energies of life on earth. Physics creates never ending new particles and forms of matter with both very large and very small energies and once science measures the simplest particles, that science is done even though science continues to synthesize never-ending and more exotic particles and forms of matter. My second read of Mind-Body Problems was even more rewarding than was my first read. This is because there is a great deal of information embedded in the many layers of Horgan’s stream-of-consciousness style of writing. A recurring theme in each of the nine plus one narratives reveals the precursors of free will, morality, and self for the consciousness of each of ten people; nine interviewees plus the author. 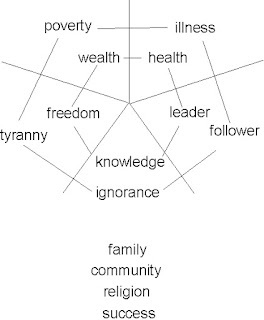 The ten narratives represent a spectrum of consciousness showing the range of five personality complements or factors (the five factors model): nonconformer versus conformer, conscientious versus careless, agreeable versus obnoxious, extrovert versus introvert, and empathic versus callous. Likewise the spectrum of consciousness also shows the five emotion complements: compassionate versus selfish, joyful versus miserable, serene versus angry, pleasure versus anxiety, and pride versus shame. These people are all well-published with high IQ’s and so do not represent either conformers or careless personalities, but do represent all the other personality factors and emotions fairly well. Since we actually live in a quantum causal set universe, it is simply not possible to know all of the precursors to the outcomes of choice, morality, and self, even though we know those precursors do exist in a causal universe. We simply cannot know all of the precursors for the choices that we make, even though we can often know many of the precursors of our choices. Since we cannot know all of the precursors for emotions, these outcome are free choice and free will. The one sore point in particle physics, though, is that gravity and charge are still not compatible with each other. 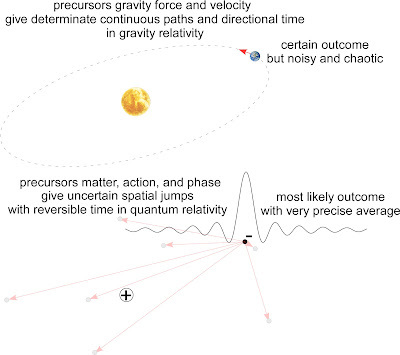 While relativistic gravity provides determinate outcomes and a certain directional time, quantum relativity provides probabilistic outcomes and reversible time uncertainty. So gravity and charge could not be any more incompatible than they are, but, since they are 1e39 different in magnitude, this incompatibility makes little practical difference in measurement science. 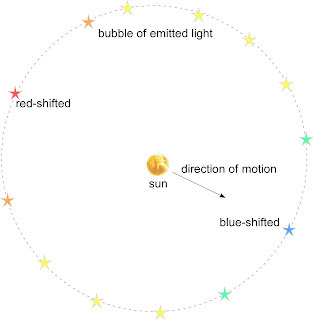 Fundamentally, relativistic gravity affects space and time and so there is no gravity self energy and sufficient gravity can capture and bind light. Charge does not affect space and time and charge does have a self energy and light exchange and emission is what binds charges together. Science is finally reaching a measurement precision that will likely reveal many mysteries about reality. Atomic clocks show a precision and dephasing rate that is amazing and gravity wave detection is now commonplace on earth and will soon be in space as well. Future measurements in space outside of earth's gravity will further show the very small mysteries of physical reality. The platinum-iridium bar that now serves as science's kilogram standard is the last physical standard based on an artifact. The IPK has inexplicably lost 0.51 ppb/yr mass relative to its frequently cleaned sisters over the last 100 years in just three measurements. 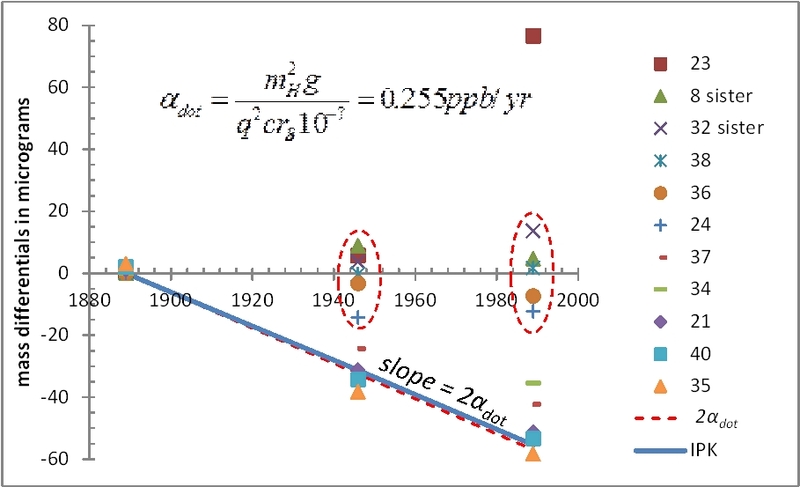 Mainstream science does not yet understand this mass loss and certainly does not believe that atomic mass really decays over time. Therefore, the revolutionary watt balance will replace the IPK as our mass standard and finally show that the atomic mass is actually in decay. 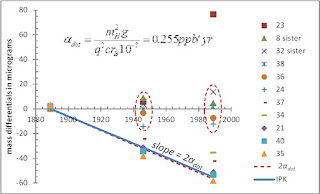 There do seem to be any number of measurements that show the very slow decay of mass as well as the growth of force as a very slow increase in the speed of light. These effects are about two or three orders of magnitude beyond the precision of current science. 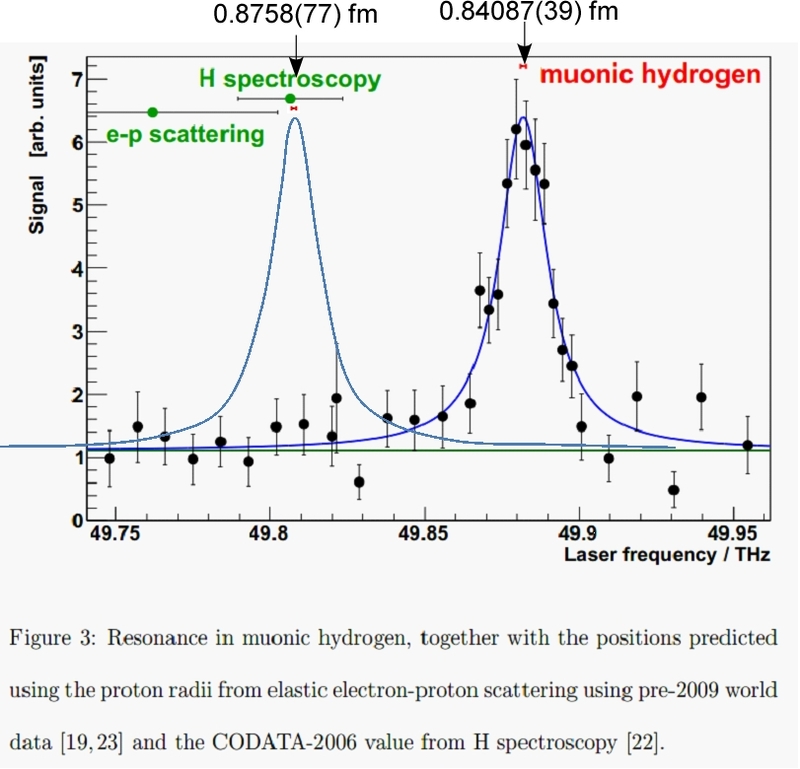 Another example is in the measured shift of muonic hydrogen resonance from that expected from quantum theory. 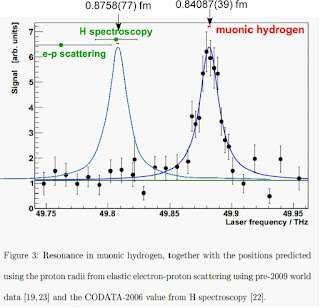 As the figure below shows, the muon decay adds a small shift that then agrees with quantum expectations. Matter decay leads to an energy shift just as matter decay is the source of all force. The precursors in space and time for the outcomes of free will, agency, and consciousness all of course simply exist in a quantum causal set. In a quantum causal set, however, there are many outcomes that have unknowable precursors even though those precursors do also exist in the causal set. The unknowable quantum precursors make quantum outcomes fundamentally uncertain and therefore subject to free choice as the free will of the conscious agents of our quantum reality. However, the collapse of quantum phase coherence means that some outcomes are still much more likely than other outcomes and that is the basis of the largely determinate classical reality of complexity and chaos. 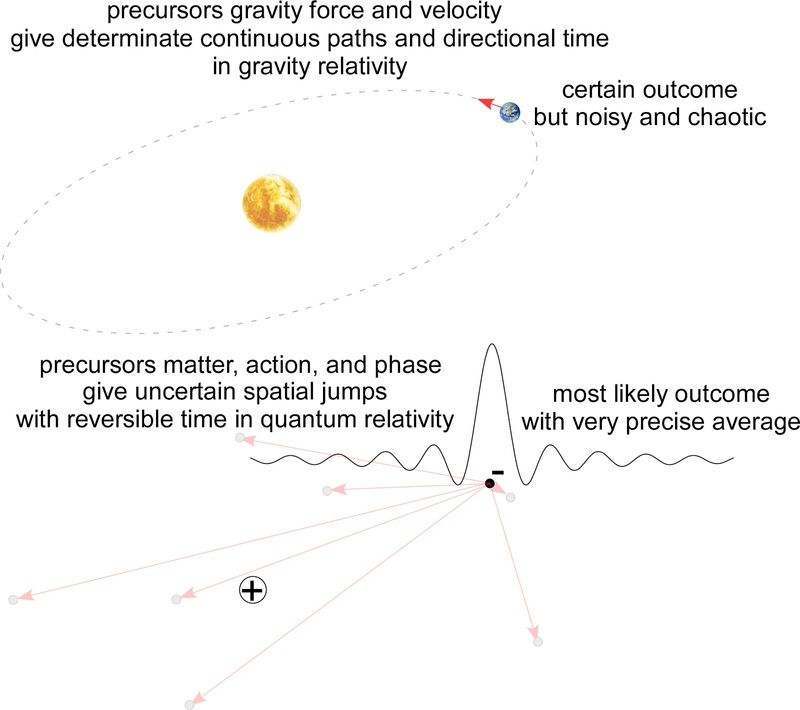 The term quantum spacetime is somewhat of a misnomer since the gravity outcomes of determinate spacetime relativity are fundamentally inconsistent with the uncertain outcomes of quantum relativity. While a unidirectional and entropic time and space are objective determinate outcomes in spacetime, quantum time is reversible and quantum space allows for both superposition of simultaneous outcomes in one place as well as entanglement of simultaneous outcomes across the universe for all time. Free will is just one of the many unconscious archetypes that are necessary precursors for the outcome of consciousness. Unconscious archetypes are unknowable precursors but are still part of universe and therefore also lead to outcomes such as consciousness. People tell all kinds of stories about the subjective precursors of the objective outcomes of unconscious archetypes, but there is no way to objectively measure unconscious archetypes, despite their being precursors to the outcome of consciousness. The universe is very complex and our limited and finite minds cannot ever hope to know all of the complexity of even knowable determinate precursors. Therefore many very smart people will continue to argue that complexity and chaos alone are what explain free will in a determinate universe and there is no quantum uncertainty involved. However, uncertain quantum outcomes mean that the universe is not really determinate after all and so given quantum uncertainty, even beyond complexity and chaos there are still fundamentally uncertain outcomes with unknowable precursors. The key difference between the outcomes of the determinate relativity of gravity and the uncertainty of quantum outcomes is quantum phase. It is then the collapse of precursor quantum phase coherence that defines quantum outcomes. It is only incoherent light and matter action that make up the determinate outcomes of gravity relativity while quantum light can remain indefinitely entangled with its matter action outcomes. It is truly ironic that the U.S. life expectancy has declined for the first three years of universal healthcare and yet people specifically tout universal health care to raise life expectancy. The drop in life expectancy is due to an increase in certain death rates and follows many decades of rising life expectancy. Two notable contributions to the recent declines are increases in drug overdoses along with increases in the suicide rates, especially for the 16-39 age group. These statistics suggest an increase in anxiety and a lack of meaning and purpose for many people. Someone without meaning and purpose will not choose life goals that have desirable outcomes with meaning and purpose. There are five life goal complements that each define a spectrum of desirable outcomes from which we choose a particular outcome. Each life goal consists of many trade-off precursors of delayed gratifications and sacrifices that altogether mean that life is not necessarily made up of straightforward choices. In fact, we often do not even know why we make some of the choices that we do make since feeling derives from the unconscious archetypes of consciousness. 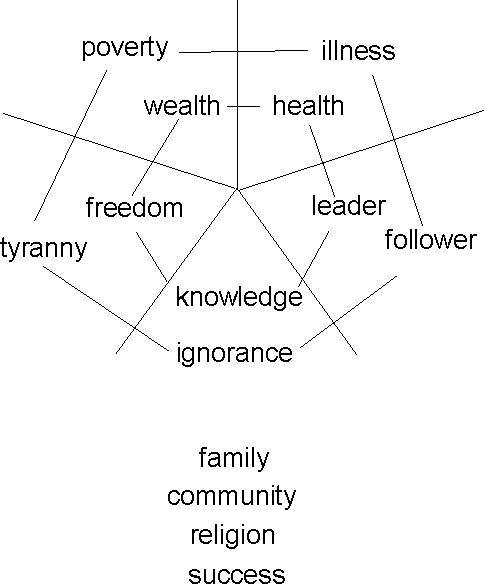 The particular choice of individual freedom versus group authority represents a classic choice between more or less acceptance of group authority and hierarchy versus less or more individual freedom. Each life goal may also focus on one or all of family, community, religion, individual success, or curiosity as well. It is by our feeling that we choose action or inhibition and feeling is a superposition of a spectrum of five emotion complements. Each person's emotion complements make up their personality archetype by how they respond to others. The emotions of pleasure and anxiety, for example, are particularly important for survival while compassion and selfishness are very important for the bonding of people into groups or communities. A superposition of five personality factor complements makes up each personality with emotion complements that determine how people bond or conflict with others. These five personality complements reflect the unconscious archetypes of consciousness that we first learn as children and then also as adults. The consciousness that we share with others depends on feeling and the meaning and purpose of life is in how well people interact with each other as well as on how well people survive. Personality factor complements represent how we interact with others in that if we are sensitive to others feelings, they will be more likely to share their consciousness with us as stories. Although it may seem like polar opinions necessarily result in divisive politics, people rarely really agreed on much and divisive politics seem to be rather inherent in human nature and not just a result of polar opinions. There have been even more polar electorates than today and when it comes right down to it, there are polar opposite arguments and feelings for every political issue. Legislation, after all, is the bonding of polar opposites into some kind of compromise and the laws that bind civilization with exchanges of ideas are analogous to exchange of light that bonds matter’s polar opposites, electrons and protons, into neutral atoms. It goes without saying that each side in an argument has some claim to virtue and superior morality but for either side to deny the virtue of the other side does not usually facilitate civil discourse. Each of us has a set of unconsciousness archetypes that are the basis of our feeling and consciousness and personality. These unconscious archetypes define how we feel about things that happen to us and it is by feeling that we choose outcomes from precursors.